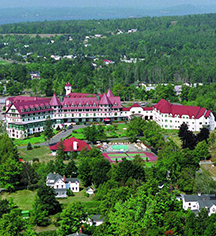 The Algonquin Resort embodies historic charm while still offering guests the best in contemporary amenities. Overlooking the arrestingly beautiful Passamaquoddy Bay and St. Andrews, the resort provides spectacular views of sandy beaches, rocky coves, and clear blue waters. Boasting a storied past spanning from the late 1800s, The Algonquin Resort prides itself on its history and pays special attention to preserving its heritage. Presenting two in-house restaurants, the resort's kitchens are dedicated to sourcing fresh, local ingredients. The resort's proximity to the resort town of St. Andrews will make for a delightful vacation excursion, but there's plenty to do at The Algonquin Resort itself. 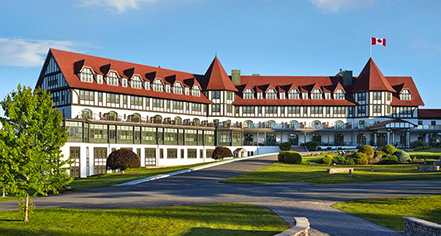 The Algonquin Resort, a charter member of Historic Hotels Worldwide since 2014, dates back to 1889. The resort re-opens after being rebuilt featuring the now familiar Tudor-style exterior and red roof. For the first time, all of the resort’s rooms featured telephone and electricity – the cost of a room at the new and improved resort ranged between $4 and $7 per day. Hotel/Resort Fees & Taxes: Please contact hotel for more information. Parking: Self-parking: Complimentary. Valet parking: $25.00 CAD per day. Free RV, bus, truck parking. Charging for Tesla electric car. Pet Policy: Service animals allowed: Yes. Pets allowed: Yes. Fee: $35 per stay. Maximum amount: 3 pets per room. Amenities: Walking map, Bed, Bowls. Shuttle Service: Hop on and hop off convenient shuttle (from the resort to town, including points of interest in between).. Learn more about the History of The Algonquin Resort .